Resides in El Dividive, Trujilo, VZ in the offseason. Spent most of the 2018 season with Triple A Salt Lake, appearing in 38 games...also pitched in 14 games with Los Angeles (AL)...Established a career high with three strikeouts on June 29 at Baltimore...Made 11 appearances with Aguilas del Zulia in the Venezuelan Winter League, posting a 1-2 record with a 3.18 ERA (11.1IP/4ER) and seven strikeouts. Began season with Double-A Mobile for nine games before being promoted to Triple-A Salt Lake at start of May ... Made Major League debut with Angels June 23 at Boston (2.2 IP, 2 H, 2 ER, 1 BB, 1 SO) ... Earned first career save Sept. 5 at Oakland after working a scoreless 10th inning (1 IP, 2 H, 0 R, 1 BB, 1 SO) ... Was one of eight Venezuelan born players to appear for Angels in 2017 ... Worked 3.1 scoreless innings Aug. 5 vs. A's in longest outing of year ... Did not allow a run in 13 of 18 outings across five stints with Angels...Stranded four of five inherited runners ... Pitched to a 2.84 ERA (19 IP - 6 ER) in night games ... Finished year ranked by MLB.com as #14 prospect in Angels system. Began season with Adv.-A Inland Empire...Converted four of six save opportuniti es and averaged 13.1 strikeouts per nine innings...Pitched to a 1.65 ERA (16.1 IP - 3 ER) during 13 game stretch from Apr. 15 - May 15 with 25 strikeouts and fi ve walks...Earned win in fi nal appearance with 66ers May 21 vs. Modesto aft er tossing one perfect inning with two strikeouts...Marked fi rst victory since July 29, 2014 for Orem...Promoted to Double-A Arkansas May 23...Led all Travelers relievers with eight saves aft er taking over closing duti es in mid-July...Finest stretch of season came from July 16 - Sept. 1, pitching to a 1.44 ERA (25 IP - 4 ER) with 25 strikeouts and three walks...Held right-handed hitt ers to a .211 (39/185) average on season combined between Inland Empire and Arkansas. 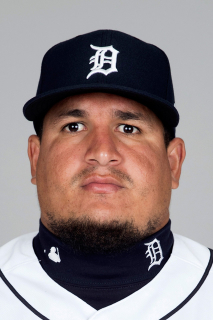 December 19, 2018 Detroit Tigers signed free agent RHP Eduardo Paredes to a minor league contract and invited him to spring training. December 19, 2018 RHP Eduardo Paredes assigned to Toledo Mud Hens. November 2, 2018 RHP Eduardo Paredes elected free agency. November 2, 2018 Los Angeles Angels sent RHP Eduardo Paredes outright to Salt Lake Bees. October 11, 2018 RHP Eduardo Paredes assigned to Aguilas del Zulia. October 1, 2018 Los Angeles Angels recalled RHP Eduardo Paredes from Salt Lake Bees. August 13, 2018 Los Angeles Angels optioned RHP Eduardo Paredes to Salt Lake Bees. August 12, 2018 Los Angeles Angels recalled Eduardo Paredes from Salt Lake Bees. July 21, 2018 Los Angeles Angels optioned RHP Eduardo Paredes to Salt Lake Bees. July 15, 2018 Los Angeles Angels recalled Eduardo Paredes from Salt Lake Bees. July 3, 2018 Los Angeles Angels optioned RHP Eduardo Paredes to Salt Lake Bees. June 28, 2018 Los Angeles Angels recalled Eduardo Paredes from Salt Lake Bees. June 22, 2018 Los Angeles Angels optioned RHP Eduardo Paredes to Salt Lake Bees. June 15, 2018 Los Angeles Angels recalled Eduardo Paredes from Salt Lake Bees. June 12, 2018 Los Angeles Angels optioned RHP Eduardo Paredes to Salt Lake Bees. June 5, 2018 Los Angeles Angels recalled Eduardo Paredes from Salt Lake Bees. May 19, 2018 Los Angeles Angels optioned RHP Eduardo Paredes to Salt Lake Bees. May 16, 2018 Los Angeles Angels recalled Eduardo Paredes from Salt Lake Bees. May 6, 2018 Los Angeles Angels optioned RHP Eduardo Paredes to Salt Lake Bees. May 1, 2018 Los Angeles Angels recalled Eduardo Paredes from Salt Lake Bees. April 29, 2018 Los Angeles Angels optioned RHP Eduardo Paredes to Salt Lake Bees. April 23, 2018 Los Angeles Angels recalled Eduardo Paredes from Salt Lake Bees. April 22, 2018 Los Angeles Angels optioned RHP Eduardo Paredes to Salt Lake Bees. April 21, 2018 Los Angeles Angels recalled Eduardo Paredes from Salt Lake Bees. April 11, 2018 Los Angeles Angels optioned RHP Eduardo Paredes to Salt Lake Bees. April 8, 2018 Los Angeles Angels recalled Eduardo Paredes from Salt Lake Bees. March 11, 2018 Los Angeles Angels optioned RHP Eduardo Paredes to Salt Lake Bees. September 3, 2017 Los Angeles Angels recalled Eduardo Paredes from Salt Lake Bees. August 24, 2017 Los Angeles Angels optioned RHP Eduardo Paredes to Salt Lake Bees. August 8, 2017 Los Angeles Angels recalled Eduardo Paredes from Salt Lake Bees. August 7, 2017 Los Angeles Angels optioned RHP Eduardo Paredes to Salt Lake Bees. August 1, 2017 Los Angeles Angels recalled Eduardo Paredes from Salt Lake Bees. July 19, 2017 Los Angeles Angels optioned RHP Eduardo Paredes to Salt Lake Bees. July 5, 2017 Los Angeles Angels recalled Eduardo Paredes from Salt Lake Bees. June 25, 2017 Los Angeles Angels optioned RHP Eduardo Paredes to Salt Lake Bees. June 23, 2017 Los Angeles Angels recalled Eduardo Paredes from Salt Lake Bees. May 2, 2017 RHP Eduardo Paredes assigned to Salt Lake Bees from Mobile BayBears. March 14, 2017 Los Angeles Angels optioned RHP Eduardo Paredes to Mobile BayBears. November 18, 2016 Los Angeles Angels selected the contract of Eduardo Paredes from Mobile BayBears. May 23, 2016 Eduardo Paredes assigned to Arkansas Travelers from Inland Empire 66ers. March 7, 2016 RHP Eduardo Paredes assigned to Los Angeles Angels. August 3, 2015 RHP Eduardo Paredes assigned to Inland Empire 66ers from Burlington Bees. April 4, 2015 RHP Eduardo Paredes assigned to Burlington Bees from Orem Owlz. October 9, 2013 Eduardo Paredes assigned to Aguilas del Zulia. June 1, 2012 RHP Eduardo Paredes assigned to DSL Angels. March 12, 2012 Los Angeles Angels signed free agent RHP Eduardo Paredes to a minor league contract.